Chinese President Xi Jinping is visiting Washington this week to participate in a major global summit on nuclear issues. Xi will also meet on Thursday afternoon with President Obama. The meeting comes at a time of ongoing tensions between the two countries. The U.S. and its Asian allies continue to express concerns about Beijing’s aggressive posture in the South China Sea. Washington would like to see Beijing put more pressure on North Korea to halt the development of its nuclear program. 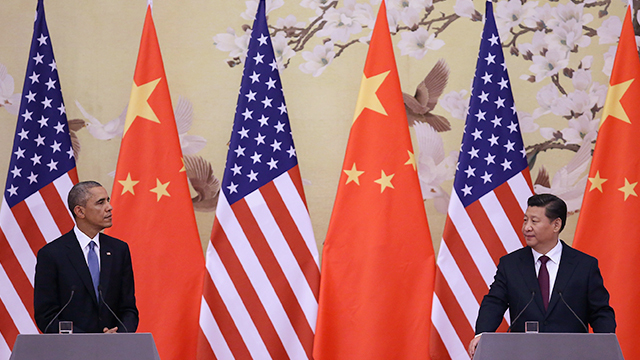 Xi’s crackdown on domestic dissent is drawing increasingly harsh criticism from many in the U.S. And Donald Trump and his competitors have made the economic challenge from China a major issue in the Republican presidential primary contest. 1Overall, Americans and Chinese do not have especially positive views of each other. In our 2015 survey, just 38% of Americans have a favorable view of China, compared with a global median of 55% across 39 countries. Only a slightly higher share of the Chinese public – 44% – give the U.S. a positive rating, in stark contrast with the global median of 69%. 2 On a list of possible issues with China, Americans are most concerned about economic issues, cybersecurity and human rights. 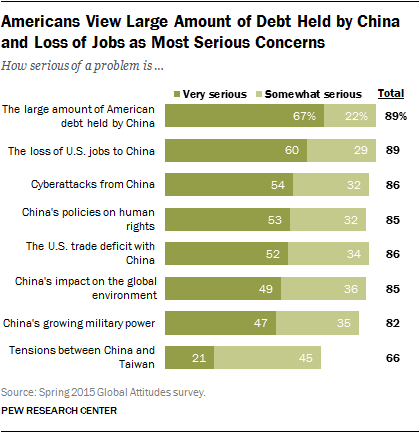 Specifically, the amount of U.S. debt held by China and the loss of jobs to China are Americans’ top worries, but cyberattacks and Beijing’s human rights record aren’t far behind. 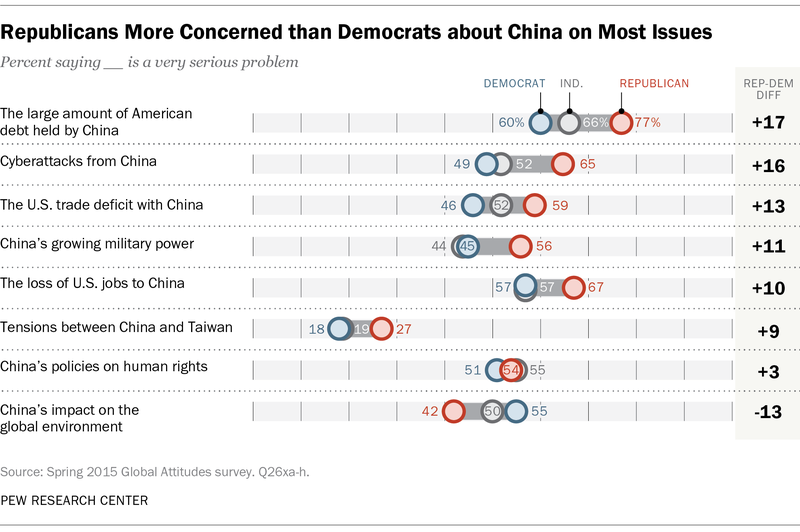 3Republicans are more critical of China compared with Democrats. From U.S. debt held by China to the loss of U.S. jobs and China’s growing military power, Republicans are far more concerned about these issues as a very serious problem than are Democrats. The exception is China’s impact on the environment, which worries Democrats more. 4Many Americans think China will ultimately become the world’s top superpower, and most Chinese agree. Americans are closely divided on this question: 46% say China either already has or will someday replace the U.S. as the top global power, while 48% say this will never happen. However, 67% of Chinese think their country has supplanted the U.S. or will in the future; only 16% say it won’t happen. 5Most Chinese think the U.S. is trying to hold their nation back. More than half (54%) of Chinese say the U.S. is trying to prevent China from becoming as powerful as the U.S. Only 28% say the U.S. accepts that China will become as powerful. 6 Young people in both countries express more favorable attitudes of the other nation. Americans ages 18-29 are more than twice as likely as those ages 50 or older to have a favorable opinion of China (55% vs. 27%). 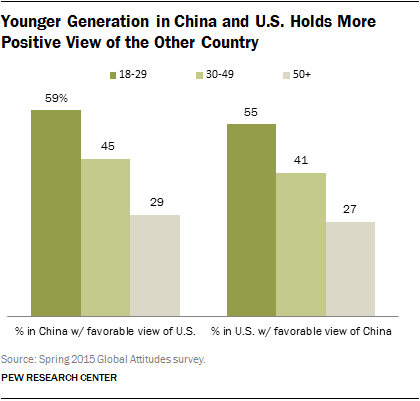 Similarly, 59% of Chinese adults under 30 give the U.S. a positive rating, compared with 29% of those 50 and older. And younger Chinese also find U.S. soft power more appealing – for example, 59% said they like American ideas about democracy in our 2012 poll, compared with 40% of the 50 and older group. Note: This post was originally published on Sept. 22, 2015, and has been updated.